Please note: eBay has stopped enabling STP for new sellers. Strike through pricing, offered to certain sellers on eBay, is a visual treatment showing a line drawn through the original price of an item and a second, lower price offering. The original list price (or "Compare at price") comes from the seller or a catalog and the new price from the seller is displayed as the "Now" price. Sellers should contact their Relationship Manager to discuss whether or not it's appropriate for them to use strike through pricing and how it may affect their performance on eBay. This option is available on selected eBay sites, including US, UK, Germany, Canada, Australia, France, Italy and Spain. The original list price - aka "Compare at price"
The original list price (or "compare at price" in eBay terminology) is the price (excluding shipping and handling costs) that comes from the seller or a catalog for the same item or one virtually identical to it. The price is based on items that are currently for sale or have been for sale within the last 90 days by another online retailer. The new, lower price is displayed as the "now" price. Strike through pricing is only available for fixed-price items where we can show a known price and savings to the buyer. It can't be used with auction-style listings because pricing can vary. Strike through pricing is also only available for new items that are the same or virtually identical at different online retailers. Once an item is no longer in new condition, price and savings are too unique for comparison. To learn more about strike through pricing, visit http://pages.ebay.com/help/sell/strike-through.html. As far as WP-Lister is concerned, STP and the Markdown Manager work in an entirely different way. While the STP / original retail price information is part of the usual AddItem and ReviseItem requests sent by WP-Lister, discounts managed by the Markdown Manager are handles in an entirely different section of My eBay and not neither stored with the listing item itself, nor can they be set when revising a listing. Revising the item price and/or postage cost for an item on the Revise my item page removes the item from a sale. We can only recommend against using the Markdown Manager on listings that are managed through WP-Lister as your sales would be disabled when an item is revised from WP-Lister. This is not a limitation of WP-Lister itself, but rather of the eBay API. When you list a product which has both a regular and sale price set in WooCommerce, WP-Lister uses the sale price as the actual "Buy Now" price on eBay, but the regular price is not sent to eBay by default. 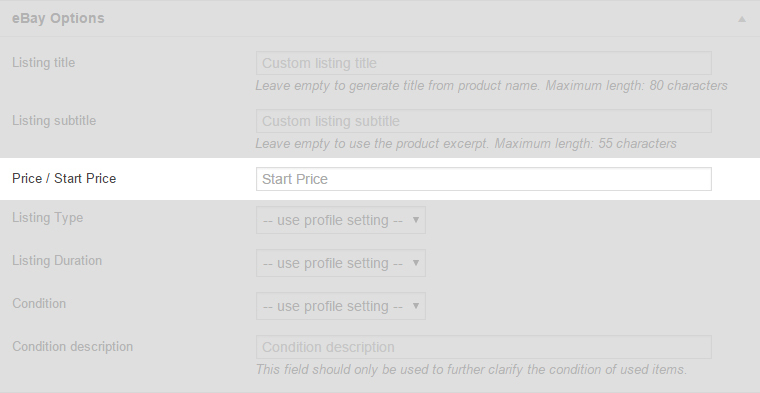 If you want the regular price be displayed on eBay as the original retail price / strike through price, you have to enable the "Strike Through Pricing" option in your profile - http://www.wplab.com/plugins/wp-lister/documentation/profiles/#Other_Options - and revise your listings after doing so. 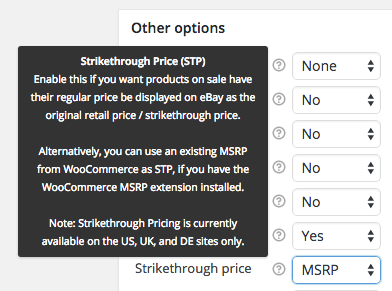 In version 2.0.9.8 or higher, WP-Lister for eBay now allows you to use your MSRP price as your strike through price, when the MSRP price plugin or WP-Lister for Amazon is installed (which adds it's own MSRP field). Simply click the strike through price options in your profile under "Other Options" and you will see MSRP as a selection. Either change your "Start price" found in the eBay section on your edit product page to display a different (lower) price than what the product is currently selling for on eBay or your website. You could use a CSV plugin to edit them in bulk as well. Or set the "Price / Start price" option in the listing profile to change the price for many listings at once. You can use percentages as well, so if you want to reduce the price by 10% for all items using a particular profile, you would enter "-10%" as the price in that listing profile. We don't see any technical reason for refusing new sellers to allow to use STP, especially since their alternatives (by design) don't work properly with 3rd party listing tools. That being said, none of the other big players seems to have heard the news yet either, but we'll keep an eye on any alternative that would work with WP-Lister in the future.